When it comes to golf products, Callaway has some of the best out there, from clubs to apparel to even bags. With myself needing a new bag, I wanted to take a look at what Callaway had to offer because of the respect I had for their company. I wanted something that would make walking the golf course easy again rather than painful and stressful, and also at an affordable price. I went ahead and tested out the Callaway Chev Golf Stand Bag. The first thing that hit me when I put my eyes on the bag was the stylish look of it. I like the red, white and black design but you can also get it in different colors and designs. Green, white and black was tempting, too. I like when there are a lot of different options out there. There are seven different color designs available which is a lot to choose from compared to most bags. Another thing I love about it is the weight. It only weighs five pounds and makes walking around the golf course very easy on your body and back. With it also being five pounds, that makes for an easy rest for the stand which is pretty sturdy in itself. I’ve read some golfers who put a lot of clubs in their bag say it could be a little sturdier, but for those who use a normal amount of clubs, it does the job well. Speaking of the stand, I’ve had several in my life and it’s always one of the most frustrating parts of walking. I know there’s a lot of you out there that feel the same. It’s either too complicated to configure or falls down with the bag. I see no such problem here. It’s very easy to set up and close up, which is what you want when you have golfers breathing down your neck trying to get you to hurry up. It will take a few minutes off your speed of play. The dividers on the top also make it very easy to store your clubs. It is a five-way top and has full length dividers so you can easily organize your clubs for when you play. The full length dividers make it easy for choosing your clubs and putting them back during a round of golf. Along with storing your clubs, you can easily store your personal belongings, too. This bag has seven total pockets, including a velour lined valuables pocket and an apparel pocket. The size of many of the pockets are big as well so you can store more than just clothes and golf accessories; you can bring your lunch and beverages and shoes as well. Some of the pockets are a bit thin, however. I would like to see them address this with the next version of their bag. But I really like its small lined pocket which is perfect for keys and phones. There is one cool little side nugget I like about the pockets; I know there’s a lot of you out there who have dropped a tee or ball by accident down the dividers in your bag and had to empty all your clubs out to get it. This bag actually has a zipper with a little pocket on the bottom of your bag that allows you to reach inside and get those little things you drop so you don’t have to dump your whole bag out. The one disappointment is there is no insulated beverage pocket. 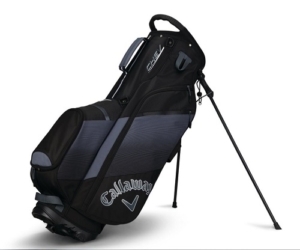 This is something I’ve noticed many newer bags coming up with, but the Callaway Chevy Bag doesn’t have one. If you live in the heat during the summer, which is most of you, these come in handy. As far as bang for your buck, the price is very reasonable, especially for the brand name. A lot of new golf bags today are selling for over $150, which is too much for my piggy bank. You can get the Chevy bag between $100-$125 depending on where you go. Amazon is selling it now right in between that. So I feel like you’re getting great value here. It’s definitely worth that price. The straps are really comfortable, too. The padding makes it less stressful on your shoulders and your back when walking the golf course. The stand straps design could be a little bit better, but that’s not a deal breaker for me. I’m content with they have in place. Overall, I know many of you are looking for a really good bag close to $100 or in that ballpark, and this one hits hits the mark. It’s one of those few bags that passes the test both on the outside and inside and will make you enjoy walking the course and make you want to play more. Give this bag a shot and walk 18 holes with ease. Lightweight – only 5 lbs. Five way tops and full length dividers makes it easy to organize clubs.